The Mechatronics Troubleshooting Learning System (87-FTSAB53) is used with the Allen-Bradley AB5300 PLC found on Amatrol’s 870-AB53. 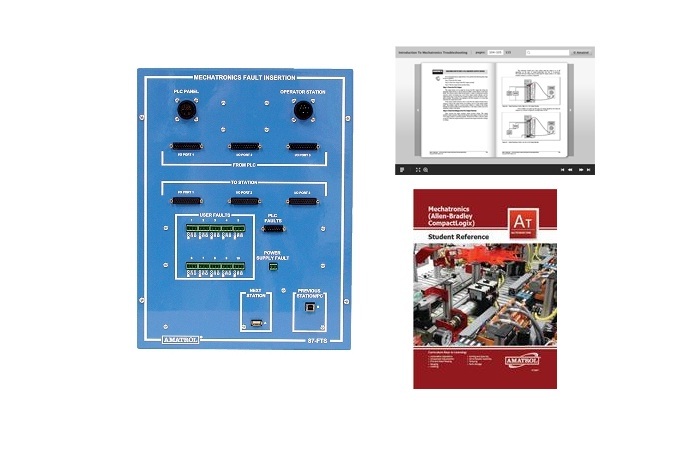 This learning system includes a fault controller with faults ranging from 29 to 37 per mechatronics station, FaultPro 4.0 software with online student troubleshooting record keeping, student learning activity packets, a teacher’s assessment guide, and installation guide. The 87-FTSAB53 covers major troubleshooting topics such as mechatronics troubleshooting, power supply troubleshooting, input/output troubleshooting, mechatronics systems troubleshooting, and processor troubleshooting. As the industry’s premier program utilizing electronic faults, FaultPro allows instructors to instantly set and tailor faults to test a learner’s weaknesses and turn them into strengths. The electronic faults also protect the equipment from incurring any damage. The skills developed by this software will allow learners to solve real-world technical problems once they’re in the field.